Botswana and termites . . . 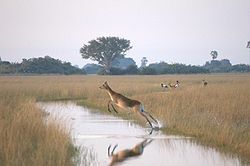 In 1985 I traveled to Botswana under the auspices of the United States’ Department of State. At that time I was gainfully employed with the United States Customs Service, and the purpose of my travel was to represent our government and U.S. Customs in a law enforcement conference. The conference took place in Gaborone, the capital city of Botswana, at a complex that included a Holiday Inn, several restaurants and two Las Vegas-style casinos. Except for South Africa, every country in Africa was represented. That nation was not represented because it was not invited, ostensibly in criticism of its rule of apartheid. Other postings on Botswana can be found here: Sojourn to Botswana, here: I downed a lion in South Africa and here: Botswana’s urinals. I have thoroughly enjoyed remembering and writing about my experiences in Africa, and I trust that visitors to my blog will enjoy reading about that nation and the trials, tribulations and triumphs I endured and/or enjoyed while enroute to Botswana, returning from Botswana and everything in between. Be forewarned! As I manage—struggle—to retrieve memories from the dim past—way back in 1985—there will be more postings related to my trip, including more thoughts on Botswana, South Africa, Germany and England. The unlikely subject of this posting? One of the most fascinating and destructive creatures on earth—termites! The termite is the acknowledged master architect of the creature world. No other insect or animal approaches the termite in the size and solidity of its building structure. The world’s tallest non-human structures are built by Australian or African termites. 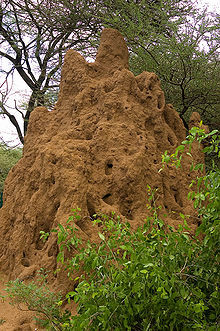 If a human being were the size of an average termite, the relative size of a single termite nest is the equivalent of a 180 story building–almost 2000 feet high. It would easily be the tallest building in the world. How is it possible that this tiny creature has the engineering know-how to erect an edifice of this magnitude? Obviously this knowledge is innate to the termite. The process of construction, the materials and correct combination of materials to yield an elegant, structurally efficient and durable structure is simply awe-inspiring. In tropical savannas the mounds may be very large, with an extreme of 9 metres (30 ft) high in the case of large conical mounds constructed by some Macrotermes species in well-wooded areas in Africa. 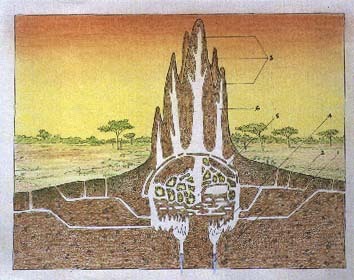 Two to three metres, however, would be typical for the largest mounds in most savannas. The shape ranges from somewhat amorphous domes or cones usually covered in grass and/or woody shrubs, to sculptured hard earth mounds, or a mixture of the two. Despite the irregular mound shapes, the different species in an area can usually be identified by simply looking at the mounds. Formlings, now better understood to depict termitaria (termites’ nests) and termites, are a pervasive category of San (Bushman) rock art north of the River Limpopo. This article investigates the associations of termites’ nests in San thought, belief, and ritual, in an attempt to explain formling symbolism and why termites’ nests, and not other subjects, were chosen for depiction. 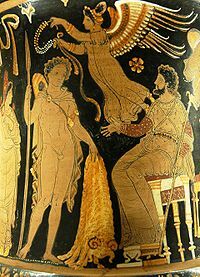 Unequivocal ethnographic testimonies of San spiritual world-view are compounded with iconographic analysis to show nuances of San understanding and perception of the spirit world. In turn, this ethnographic hermeneutic reveals a significant but previously unexplored facet of spirit-world imagery which evokes notions of creative and transformative power. This newly highlighted vignette of San cosmology unlocks aspects of San imagery, such as the interface between the natural and the metaphysical, that have hitherto been less understood. 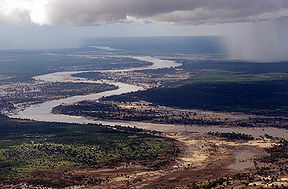 Note: The River Limpopo separates South Africa from Botswana and Zimbabwe (from Wikipedia at this site: River Limpopo). Since my duties while in Botswana did not require any close inspection of termite nests, my relationship and contact with such structures was limited to a cautious 360 degree visual inspection from a distance of several yards. That inspection and my Wikipedian research qualified me to share my new found knowledge with visitors to my blog. So I shared said knowledge. Sojourn to Botswana . . . In a recent posting I mentioned a business trip I made to Botswana, Africa via London, England and in that posting I promised—threatened, really—that I would follow up with more details of that trip. One may view that posting by clicking here: I married my barber. Today’s posting is a start to fulfilling that promise—or that threat, depending on how one reacts to my literary efforts. Long, long ago in the past century—1985—I traveled to Botswana under the auspices of the United States’ Department of State. The purpose of my travel was to represent our government in a law enforcement conference. 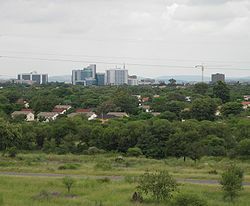 Botswana’s capital city of Gaborone hosted the conference—every country in Africa was represented except South Africa. That nation was not represented because it was not invited, ostensibly in criticism of its continuing rule of apartheid. A special note: All the African delegates to the conference were male and black—no exceptions—and all were, in varying degrees, fluent in English. That was especially beneficial to me, because I lack fluency in only two languages—English and Spanish—neither of which is compatible with any of the myriad native languages spoken by representatives of the various African countries. I managed, fairly well, in conversation with the British officer from Her Majesty’s Secret Service. And some say that George had no sense of humor—imagine that! Believe me, that’ll make your ears perk up! Click here for Botswana, a fascinating study of a fascinating country and its people, here for Britian’s Secret Intelligence Service (SIS), and here for our Central Intelligence Agency (CIA). These are only suggestions intended to prepare you for future postings regarding my great adventure in 1985—the clicking is not mandatory, but I believe you’ll find all three sites tremendously interesting and educational, and that’s a good thing! The Republic of Botswana is a landlocked country in southern Africa. Citizens of Botswana are called “Batswana” (singular: Motswana), regardless of ethnicity. 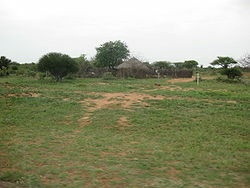 Geographically the country is flat and up to 70% is covered by the Kalahari Desert. 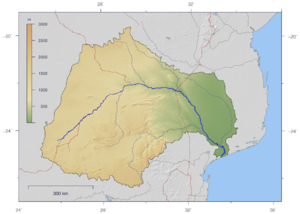 It is bordered by South Africa to the south and southeast, Namibia to the west and north, and Zimbabwe to the northeast. Formerly the British protectorate of Bechuanaland, Botswana adopted its new name after becoming independent within the Commonwealth on 30 September 1966. It has held free and fair democratic elections since independence. The official languages of Botswana are English and Setswana. In the northern part of Botswana, women in the villages of Etsha and Gumare are noted for their skill at crafting baskets from Mokola Palm and local dyes. The prevalence of HIV/AIDS in Botswana was estimated at 24% for adults in 2006. Approximately one in six Batswana has HIV, giving Botswana the second highest infection rate in the world after nearby Swaziland. I flew from Washington’s National Airport to New York’s JFK, then on to England’s Heathrow Airport for an overnight stay, then non-stop to Johannesburg, South Africa. Immediately on landing I was met by two officers from South Africa’s equivalent of our CIA. They first introduced me to an Immigration officer, and that officer secured my passport and retained it throughout my stay in Africa. It was returned to me just before I boarded a flight bound for Germany. The two agents entertained me for several hours while I waited for my flight to Botswana. They took me on a tour of their headquarters, and then we took an extensive motor tour of the city with my guides (captors?) pointing out and describing points of interest. And now I must beg for your forgiveness—I’ll leave you hanging in suspense, waiting for a subsequent posting that will provide more details of that story. A single posting cannot possibly cover all the details of my visit to Africa. Each additional posting will be titled Botswana sojourn continued, or some similar phrase. Stay tuned for more later, and in the interim it might be helpful—informative and intellectually productive—to spend some of the waiting time on the sites highlighted above.